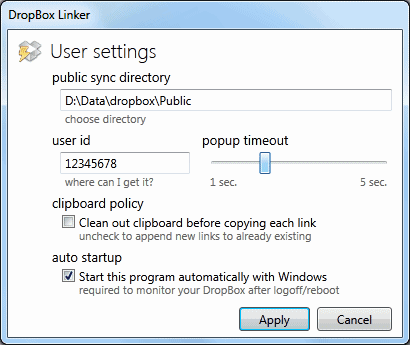 If you are a frequent dropbox user, you might have noticed if you want to share a link (public url) of a file you recently added to your dropbox folder, it’s a 3 step process to copy the url link to the windows clipboard. By default, to copy a file’s public url you have to Right Click > Dropbox > Copy public link. Check out DropBox Linker <link>, a very useful app. which works along side with Dropbox. 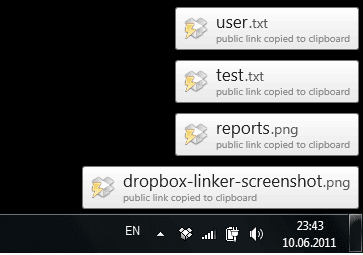 It monitors all new files added to the dropbox public folder and smartly copies the URLs to the windows clipboard. While this utility running in the background, you will get the url link of the newly added file automatically copied to clipboard and also see the corresponding tray notification of the same. But perhaps the most useful feature of this app. is that when you add multiple files to your dropbox public folder. Previously you would have to individually copy the link to each file separately to prepare a list of url links to those file which can take forever. 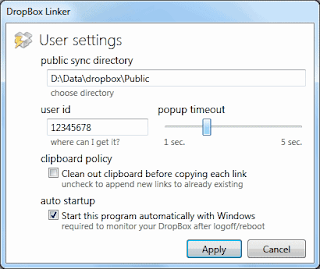 But with DropBox Linker, this process will be automated as this utility appends new links to the clipboard as the files are being uploaded, so when you add multiple files, a list of url links will be copied to the clipboard. If you rename a file in the Public folder, and the file url link was already copied in your clipboard, the link are updated automatically with the new one. Additionally, if you decide to remove a file while uploading multiples its URL will be removed from the list of urls from the clipboard. You just need to configure once by providing the Public folder path and User ID to the utility. Dropbox is cool, but I recommend you also try FluffyApp which is tray application to upload files to the cloud. I think it’s better for regular users and it allows to auto-upload screenshot of parts of the screen and copy links to the clipboard automatically. And if you looking for quick and temporary options to share some files easily then try the browser-based drag drop uploading sites like min.us and letscrate, gopileus.